It may not last long but there is something positive about the struggles that began in Bosnia last week. The original issue was over the privatisation of 5 factories in the Tuzla Canton. These were Dita, Polihem, Poliolhem, GUMARA and Konjuh. Privatisation in the past have been followed by shutdowns. Not unusual in ex-Yugoslavia the factor that sparked things off was the vicious response of the police. Overall police repression was really severe and it was one of the triggers for these riots. There are numerous videos showing police beating up people, throwing rocks at them or throwing them in a river (1). It was the last straw for many. On February 7, Bosnia was on its feet protesting against corrupt government, unemployment and the overall social situation. The situation erupted and masses were on the streets. In Tuzla, police surrendered to protestors, laid down their shields, helmets and batons, and let the masses storm the buildings. Protestors burned down the headquarters of Tuzla’s City Assembly and that of the City Administration (2). In the wake of these protests the local prime minister offered to resign as a set of demands were incorporated into a “proclamation” issued by the “Plenum” of “workers and citizens of Tuzla Canton”. This called for the privatisations to be rescinded and the factories to be started up again. It then added calls for equal wages of functionaries with workers, a new government of technocrats whose work would be monitored weekly by all “interested citizens”, control of policing, and end to payments for ex-ministers (3). Now we could say that this or that measure in the list is not very promising but many of them echo the kinds of things that the Paris Commune was trying to implement 150 years ago. And we should remember too that this is the initial stages of a movement in a territory that not so long ago was tortured by civil war, ethnic cleansing and imperialist intervention (4). There is no mention of nationalism so who knows, it could develop in an autonomous working class direction. Or it could yet be captured by some other capitalist faction which demands only a reform of the political system. Recent history hitherto says the latter is overwhelming favourite but at some point history always turns so we cannot rule out the development of an independent working class movement. There is some promise here. In Mostar, protesters stormed and burned down the headquarters of the Herzego-Neretvanian government. After that, they burned down with Molotov cocktails the headquarters of the City Administration, the Croatian Democratic Union’s and the Party of Democratic Action’s HQs. Police didn’t intervene, because in the last few months they haven’t chosen a director of regional police, who is the only person that can activate Special Forces. In these demonstrations, protestors from “both sides of the river” (i.e., both Bosniaks and Croats) participated. The parties whose offices were attacked are noted for their nationalist stances and the fact that not only Bosniaks and Croats but even the Serbs of Banja Luka are now involved is also promising. We wrote recently about the dead-end of nationalism in the Ukraine. After the collapse of the Stalinist state capitalist apparatus and the wars which followed in the Balkans in the 1990s, Eastern Europe as a whole has become almost synonymous with a rabid nationalism of the ethnic cleansing variety. There is nothing like a bloody war for reinforcing nationalist notions of difference. There is nothing better than nationalism, racism and chauvinism in wiping out the elementary solidarity of those who work alongside each other at the same level. Ruling classes everywhere play the nationalist card to destroy out all notions of class solidarity. So the recent riots in Bosnia stand out. They demonstrate that all the propaganda in the world cannot put the class genie back in the bottle once the crisis and its effects are generalised. When we are talking about Bosnia, people usually like to emphasise only problems related to national identity, while they “forget” social ones. Bosnia is in a really big economic crisis, that has highly enhanced austerity measures and flexibilization of the labour market, along with well-known problems of 1990s privatization, incredibly high unemployment (44 percent of workers are unemployed!) and a high number of workers that work and don’t receive salaries. The privatization of companies in ex-Yugoslav countries usually resulted in companies’ bankruptcy and workers losing their jobs, as new owners were not interested in investing in companies, but only in “sucking out” capital and surplus as fast as possible. The level of class hatred against the bosses and the politicians who became rich on working class misery is enormous. After the riots the ruling class was not slow to react. The prime minister resigned and then the propaganda machines of all the nationalist politicians went into full swing denouncing the rioters and trying to incite one group against the next. According to the leaders (Croat, Bosnian or Serb) it was either an EU or US plot or one by Bosniaks wanting a more centralised state than the post-Dayton federal version. The media assault cannot be underestimated in neutralising the movement from spreading further but as the economic situation in ex-Yugoslavia is now dire everywhere the ruling class will have their work cut out to keep up their nationalist offensive. The grafitti that appeared in Tuzla of “Death to All Nationalists” was one sign but there are others. … while the Serbian vice president issued his calls for stability, the Belgrade Police Union issued a statement where they showed sympathy for social protests in Bosnia, claiming that a similar scenario is possible in Serbia “where there are also many destitute, unemployed, or employed people not receiving salaries, with corruption at all levels and political manipulation of citizens” and threatened to join demonstrations if they appear in Serbia. That should be taken really seriously, considering the industrial struggles of workers in Kraljevo and Vranje that even blocked a highway on February 12 (5). A plenum is an assembly of all the members of a group. It is a public space for debate. It has no leaders or prohibitions. Decisions are made publicly.… A plenum is not a political party, or an NGO, or a one-person association. A plenum is the real, and the only, democracy (6). And there is no doubt that they represent something new. Something akin to proletarian democracy as we would like to see it working. These are extraordinary developments. 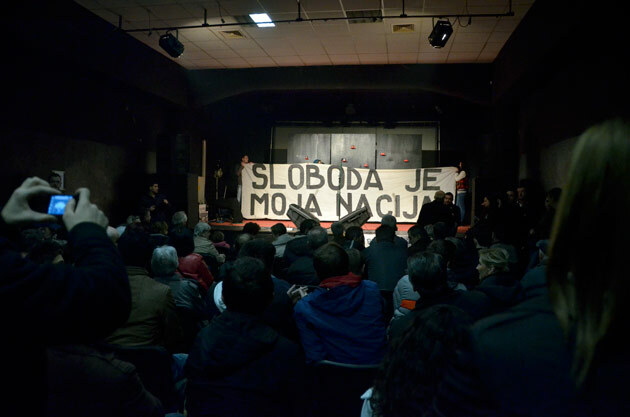 Every day since the protests began, thousands of citizens in Tuzla, Mostar, Sarajevo, Travnik, Zenica, and other towns meet in public places, where they take turns to address the gathered citizens. At the end of each meeting, a list of concrete demands is drawn up and voted on. Each person gets one vote; there is no option to abstain. So far, government officials have resigned in four cantons while new citizen-led structures are developing in plenums (7). … if new leaders emerge and if they focus on realistic demands, something might really change (8). In short, they should bow down before international capitalism, accept more privatisation and thus job losses and then go back to letting the “leaders” run affairs on behalf of international capital. There is no doubt that the plenum movement has posed a question but it is only the working class within the movement that can answer it. Workers in Bosnia should not be taken in by the repeated lie that “better democracy” can improve their lot. There can be no such thing as “better democracy” without the abolition of the capitalist state and the institution of a classless society based on satisfying real needs. There is no emancipation for us under capitalism. Workers in Bosnia need their own political agenda for class autonomy. In the long run too the Bosnian working class can only kick things off – the rest of the world’s working class have to take up the banner of class war everywhere. (1) See Juraj Katalenac on insurgentnotes.com or libcom.org. Most of the factual information here is taken from that document or from additional information supplied by the author. The opinions are ours. (3) For the full proclamation see europe-solidaire.org.